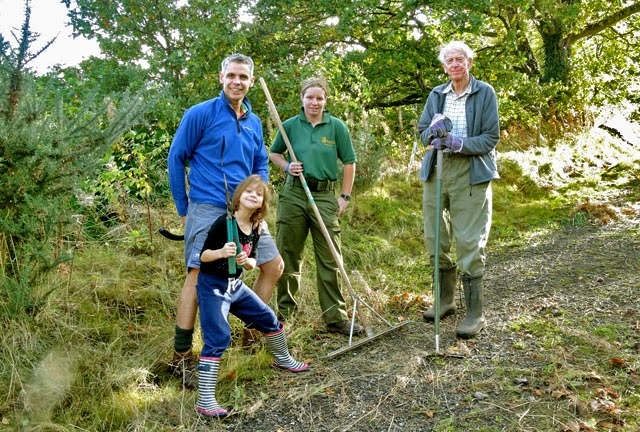 Many thanks to those who recently attended the recent Autumn tidy up at Crackley Bridge. A good time was had by all those taking part, as these pictures show. There is another opportunity to help leave a lasting legacy this coming Saturday. A kind donation of 1000 native bulbs has been made by Jerry Beresford of Tudor Environmental and these will be planted this Saturday predominantly around the entrances onto the Greenway. Jerry already has a team of 6 to undertake the majority of the planting. 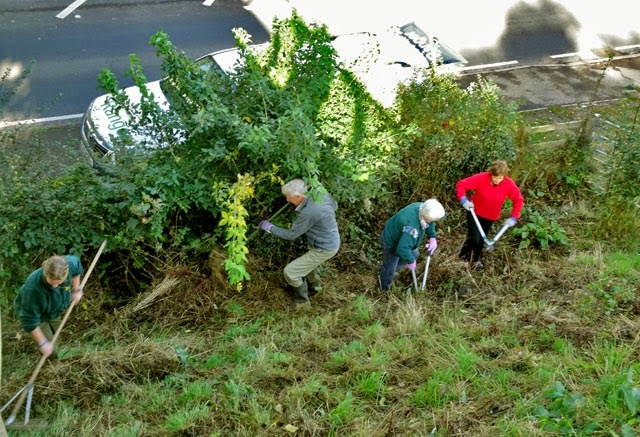 If you are interested in assisting, then you are invited to meet up at 10am, Saturday 1st November, at the Cromwell Lane Bridge over the Greenway in Burton Green. 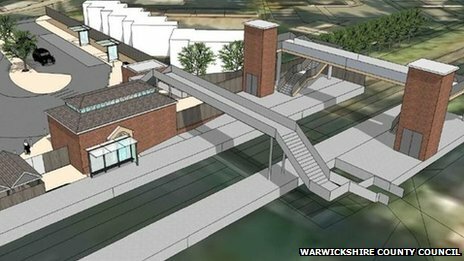 A new rail station is to be built on Priory Road in Kenilworth. Warwickshire County Council is holding a public exhibition to provide you with further information and to enable you to choose the design concept of your new station. We would like to hear your views and have your input on the design concepts. We look forward to seeing you at the exhibition. Your views are welcomed and a Feedback Form is available for you to make your choice regarding the design concept of Kenilworth Station and to submit any further comments. This is a summary from Cllr Marcus Stewart of last week’s Select Committee visit. On Tuesday 7 October four members of the Select Committee visited Burton Green. Ahead of the visit, the Parish Council, Residents’ Association, Action Group, Greenway Trust and Primary School worked together to ensure Burton Green presented itself with one voice and stressed the serious impact HS2 will have on the parish. These local groups were also supported by Warwickshire County Council, Warwick District Council and Jeremy Wright MP. The committee visited the school, the Greenway and the top of Red lane. They then moved on to the Village Hall where they were met by Chair of the Parish Council, Vaughan Owen. The main messages were seven years of construction problems, residents already leaving the village, the HGV route passing the school, construction noise, spoil being imported into the village, the number of compounds in the village, houses lost and many residents affected, loss of local ancient woodland, the route going right through the middle of the village, houses encircled by HS2 workings, the siting of the ATFS near to homes, and the noise at the tunnel entrance and exit. Committee members heard an overview from Andy Gibbs of the Action Group, listened to Rona Taylor of the Residents’ Association explain the permanent impacts HS2 will have, Councillor Stewart covered the construction issues, then Andy Gibbs talked about mitigation and compensation. The feedback from the select committee was that these messages were heard loud and clear on the impacts of the parish. The HS2 team in attendance were very quiet and did not challenge any of the points made. The day was good preparation for appearances in front of the Select Committee. Minutes of the Annual General Meeting of the Burton Green Residents’ Association held on October 6th 2014 at the Village Hall. Rona welcomed everyone, in particular Cllrs. Ann Blacklock, George Illingworth, John Whitehouse, Ian Cox, Adrian Hickinbottom and Vaughan Owen. Apologies had been received from Cllr. Michael Coker, Sylvia Clifford, Carol Green, Nick & Sue Hogue, Bron Putnam, Derek Silk and Mary Webb. The minutes of the last Annual General Meeting of October 7th 2013 were accepted. Inconsiderate parking had been a key issue and it had been suggested the police talked to a disabled resident who had been experiencing difficulties. This had been actioned. A notice had been suggested at the Village Hall asking users to park with consideration. It has been a very busy year, with the Residents’ Association responding to key issues for Burton Green as well as organising a number of interesting social events. Working with our Parish Council, we have taken a very professional approach to opposing plans for a solar farm at Nailcote Farm. We insisted that Green Energy Ltd consulted Burton Green, something they had omitted to do before announcing their plans; a consultation event followed by a presentation to the Parish Council was arranged for February 24th. A small sub group researched the issue and after Green Energy Ltd formally submitted their proposal, we produced an excellent submission to Solihull Metropolitan Borough Council, which was outlined to residents in a public meeting on August 15th. There were 360 signatures to our petition and 80 written objections, including letters from Jeremy Wright, MP and Caroline Spelman MP. Although the Planning Department at Solihull Council recommended Green Energy’s proposal should be rejected, the Planning Committee deferred a decision at their meeting on Oct. 1st.We are continuing to press Burton Green’s case. Working with the Burton Green HS2 Opposition Group, we have continued to maintain a high profile in opposing HS2, responding to consultations and submitting a petition to Parliament. The Select Committee will be visiting Burton Green on Oct 7th and they will hear the Residents’ Association’s and the Parish Council’s petitions later this year. Social events have added to the vibrancy and cohesion of our community. Lunches for the retired of Burton Green continue to be well supported; the next one is on October 31st.Our Christmas tree on the Jubilee verge was a lovely focus; this year carols round the tree on December 16th will be followed by mulled wine and mince pies in the Village Hall. The Jubilee Group’s Jazz Evening in June was a resounding success; our thanks are due to Peter and Janet Stanworth who hosted this event and have also agreed to host an event next June. The World War 1 commemorative afternoon tea was a very special event with an outstanding display of photos, articles and artefacts. The Residents’ Association is working on a number of tasks identified by the Parish Plan. One initiative has been the Youth Forum in September, when we consulted our children and young people about what they would like for Burton Green. A quiz night is planned for November and we hope to have the Warwick County Council mobile youth club bus visit Burton Green on a regular basis. The Speed Watch Team, led by Pat Hehir, have been out on a weekly basis and they are always looking for new recruits to share the load. We look forward to the planned reduction of the speed limit. We value our close relationship with Warwickshire Police. The community wished PC Pete King all the best on his emigration to Perth, Australia and we welcome PC Trent Mc Murray as our new community PC. We have continued to be proactive in liaising with Warwick District Council and Solihull Metropolitan Borough Council to ensure potholes are reported, the Jubilee Verge and Village Hall verge are mowed and Red Lane pavements kept clear. The Bugle, published four times a year, continues to be an invaluable communication channel and its human interest articles are particularly popular. The Editor is always looking for new contributions. It is clear we continue to be a proactive community, with residents giving very freely of their time. Thanks to everyone for their support. The Income & Expenditure Account was introduced by Terry. He thanked Peter Tacon for inspecting the accounts. He explained it had been a quieter year than the previous one with just over £5k income. Summertime Jazz had been less expensive than Oddsocks but made a small profit of just over £500 which had been transferred into generaI BGRA funds. The Highgrove visit had resulted in 86p profit! Unattributed assets stood at £2374 and BGRA committee was considering how to use this. Peter Tacon had again agreed to act as Independent Examiner. The constitution required that the officers and three committee members should stand down. All the officers, Rona Taylor, Mary Webb, Terry Heyes, Janet Hickinbottom and Judi Hibberd, were re-elected. Bron, Alice and Faith were prepared to stand again as a committee member. Others remaining on the committee were Hilary Cox, Andy Gibbs and Diane Swindells. Andy Gibbs said the Select Committee would be visiting Burton Green the following day. It was hoped to show them what a good place Burton Green is and to give clear messages about the changes we want to mitigate the impact of HS2 on Burton Green. Later this year those who had petitioned were likely to be asked to attend the committee. Training would be arranged for those involved. Rona Taylor would be presenting for BGRA together with Andy Gibbs. Marcus Stewart would be representing the Parish Council and John Whitehouse the Greenway Trust. The response to the compensation consultation has gone in. Andy said the general message was that HS2 was likely to happen but not certain. Residents could now only wait and see and fight for a better deal for Burton Green. By Christmas there should be no further consultations. Save NHS and scrap HS2! Thanks were given to Andy and the HS2 opposition group which has been working so hard on our behalf for more than four and a half years. Burton Green was proud that it always acted professionally and submittedresult written consultation responses thanks to Andy. Cheryl Ward, Chair of the Village Hall committee said the hall remained very popular and was overbooked. If HS2 went ahead, the Hall would be demolished and HS2 had agreed to replace it like for like. A location would have to be established and the committee felt it would want a hall around 30 per cent larger. A survey had been carried out in the village and residents had said the Hall must fit the environment, should have green space and there were many ideas for its use. The committee had already drawn up some principles and were visiting other halls for inspiration and ideas. Discussions were ongoing with the Parish Council. Once matters were clearer, a public meeting would be held. Deirdre thanked everyone who took part in the Made in Burton Green weekend of yarn bombing. Residents were recommended to see the video on John Webb's website. 200 people had visited the hall and £60 had been donated to Macmillan. Over 400 people had visited the yarn bombing during its installation. There had been input from Canley cubs and Beavers, Berkswell Beavers and Burton green School. Thanks were given to the Parish Council and BGRA for their financial support and National Grid for permission to use the land and Warwickshire County Council Parks Department for allowing the scarecrows alongthe Greenway. It was hoped to arrange a similar project in 2016. Thanks were expressed to Deirdre and her team. PC Trent McMurray had recently taken over from Pete King as our Community Police Officer. He explained he had held this role on Warwick for four years and so had experience in community policing. With regard to incidents since April, he said there had been no burglaries, vehicle crime, serious incidents etc in Burton Green and that crime was down generally. There had been a theft on September 28th at the former Le Van site; and on September 19th a safe had been found in Hob Lane. There had been damage to a vehicle in Hodgetts Lane and 16 incidents in Leamington and Kenilworth and 51 in Tile Hill had been carried out by someone with an air rifle or similar. Residents were asked to ensure they reported these or similar incidents. The number to ring for non emergencies was 101. Community speedwatch volunteers were always needed as was a Neighbourhood Watch Co-ordinator. The latter role just involved taking messages and relaying them and Rona suggested Paddy might be willing to do this as part of her running of the community email system. She would enquire. There was concern that HS2 had bought 14 properties in the village and and 6 were still empty. Rona said PC Mc Murray was very welcome and thanked him for his contribution. Cllr Whitehouse said he was also representing the Greenway Trust and the Kenilworth Centre. He apologised because of unreasonable delays regarding new speed limit implementation. There was still no firm timescale and the 20mph limit outside the school would be even further delayed because of obtaining equipment. There were new operational arrangements regarding Warwickshire Fire and Rescue service. Response time differences between urban and rural areas had been changed by the adoption of equal standards. In rural areas the first engine was to arrive within 10 minutes within 75 per cent of the time and a second engine within 15 mins for 90 per cent of the time. This was to be achieved by changes to shift patterns. The building of Kenilworth Station was on track with a completion target of December 2016. The Schools Sufficiency Strategy was out for consultation. This was looking at the likely future demand for school places throughout the county and was part of a broader need to think through infrastructure needs over the next few years. An overall strategy was to be devised to respond to Local and individual plans. School admissions had been a big issue recently. The County would not acknowledge an all party recommendation to accept siblings. The two Children's centres in Kenilworth were now managed by Barnardos services. They were going through a consultation process and hoped to produce economies of scale. Burton Green had benefitted from current electoral arrangements. The County now had a divisional boundary review by the Local Government Boundaries Commission. Proposals would fundamentally change Burton Green which would become part of a very diverse rural area made up of a number of parishes. This was out for consultation. Cllr Ann Blacklock said the District Council had been very busy with not much to show as a result. The production of a Local Plan was still in progress and the hope was it would be submitted to the government inspector in the winter for acceptance or rejection. It was vital to have a Plan in place. If accepted, it would be implemented in 2015/16. Cllr Blacklock attended parish council meetings to assist. She enjoyed supporting BGRA events too and the Made in Burton Green weekend. She was also on the committee of the Greenway Trust and said the Greenway was highly valued by Burton Green residents. With regard to HS2, Debbie Prince was the officer responsible for liaison with HS2 Ltd and she was very sympathetic to the village's situation. Cllr Blaclock was working regarding the relocation of the Hall and playground and saw these as positive outcomes of the situation. BGRA was to be commended on its positive outlook and excellent well attended events. Cllr George Illingworth said he was also Chair of Kenilworth British Legion and remarked that the Chair of Burton Green Parish Council had laid a wreath last year and would do so again on November 9th on Remembrance Sunday. He said it had been suggested that the District Council boundary be extended to include the university. This was yet to be decided. He remarked that without a Local plan no housing could be built in the village but obviously, there was a need for some form of housing development. Le Van ( now called Broadwells) was a prominent issue and involved several departments of the District Council. Everyone was frustrated by an inability to control development because of the loss of a legal argument and so it was a permitted development. One resident remarked that a number of deliveries had been a problem for someone in Red Lane who had been receiving deliveries which were intended for the site. The delivery of a skip to this wrong address had only just been avoided. Solihull professional planners had recommended refusal of the solar park application. Many objections had been lodged by individuals and by two MPs. Residents were urged to stand firm and keep up their opposition. Cllr Vaughan Owen said the Parish Council had been looking at the Le Van site over a long period.be oints and District councillors had been very helpful regarding planning issues. He said the Parish council wanted to work with all village organisations as he accepted villages felt under siege. He too could not understand Solihull's stance on the solar farm proposal and said cross border discussions were always difficult. The Parish Council had petitioned the govt about HS2 and was working to resolve the issue of the playground. Councillors were interacting with the Village Hall committee and Cllr Owen had arranged a visit to Wolston Village Hall. The attendees had found out how that hall was funded and the challenges faced during building. The Neighbourhood Plan had been put on hold till more government funds were available. Thanks were given to all councillors who had worked on behalf of residents over the past year. The next Annual General Meeting would be held on Monday October 5th 2015 at the Village Hall. Beer Mat Mentoring is the monthly gathering of entrepreneurs and aspiring entrepreneurs. The next session is on the fine art of negotiation, so many people will find it of interest. There is also an opportunity to raise individual issues. No charge but do offer the speaker a drink! More info from Jerry Marshall, 0794 1017236. Around 50 people of all ages enjoyed the last Messy Church in Burton Green. There’s a wide choice of games, crafts and activities, followed by a short celebration time with a story and song, and finally a meal for everyone. The next Messy Church is on the theme of the parable of the sower. There’s no charge but voluntary donation to cover the cost of the food and materials.